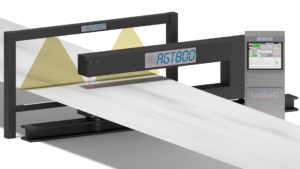 AGTVision™ is a strip width, edge detection and strip centerline measurement system. It is available as a standalone unit or as an option for new and existing A.G.T. gauges. This system mounts independently of the gauge C-frame and connects to the gauge’s electronics cabinet. Our system is specifically designed for the steel industry where sheet or strip widths can vary from job to job. The resolution/accuracy is dependent on your overall width range requirements not on the width of the strip or sheet. There are no moving parts, so re-calibrating after each production run is not necessary. This reduces downtime and maintenance required for the system. AGTVision™ can also measure strip off-center position and detect edges. This allows the system to alert an operator when the material is skewing to one side. An analog output can be used in coordination with a strip steering control system to correct strip skewing. Digital outputs are available for out of width or off-center conditions that can be used for operator alerts. AGTVision™ can help processors reduce cost, increase efficiency and improve their ability to compete in an increasingly competitive marketplace. *Some existing gauges may need a computer upgrade to accommodate the addition of the AGTVision™ system. Our simplified hardware design has no moving parts, minimizing maintenance and recalibration requirements. The measurement system utilizes the latest in high contrast vision technology, reducing the need for peripheral hardware. 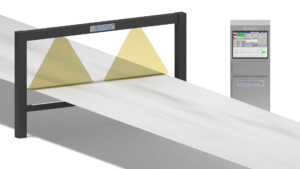 The AGTVision™ system configuration provides a very reliable platform for strip width, strip off-center measurement and S.P.C. reporting. All width and strip centerline data is automatically stored on the system and/or on a networked drive. The data is available for analysis with our optional Offline Data Analysis Software, a spreadsheet or any S.P.C. package. The AGTVision™ Strip Width Measurement System can be mounted freestanding on the floor or on existing building support structures. For steering control interface our system provides an analog output that is positive and negative. This indicates to the steering control if the strip is skewing left or right. The interactive display shows real-time graphical representations of measured width, width deviation, width histogram, centerline measurement and centerline deviation.